The Hotel Sendlinger Tor is a 2 star rated hotel located in the district of Altstadt-Lehel approximately 800yds from the Munich city center. Rates from just €49 per room per night. This centrally located hotel is just a 1-minute walk from Munich’s Pedestrian Area, Old Town and Sendlinger Tor Underground Station. It offers modern rooms with flat-screen TVs and free Wi-Fi. Breakfast is available until 12:00 at Café Wörner, just 60 metres from Am Sendlinger Tor. There are several restaurants and bars in the area. There are many attractions near this hotel, the closest of which being the Sendlinger Tor which is little more than an approximate 2 minute walk away. Also within walking distance are the Asamkirche, Registratur, Die Bank and Munchner Stadtmuseum. See the list below for all attractions and their distance from the Hotel Sendlinger Tor. A number of restaurants are located within just a few minutes walk from the Hotel Sendlinger Tor. If you're feeling like some Wine Bars food, then the Punto di Vino is just 2 minutes walk away from the hotel. If you fancy something different, there are other restaurants within walking distance to try such as the Lamms (German), Restaurant alla Scala (Italian), Foyer Restaurant im Oberanger Theater (Cafe) and Pizza Hut (Fast Food). 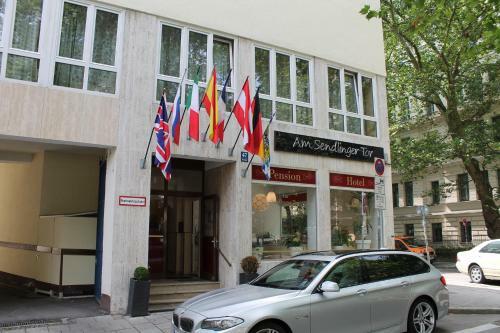 The stations Sendlinger Tor, are within 250 meters of this hotel. The Bus 152, Tram 16, Tram 17, Tram 18, Tram 27, U1, U2, U3 and U6 can be accessed from these stations. The quickest way to get to the city center (taken as Marienplatz) from the Hotel Sendlinger Tor is as follows. Walk approximately 2 minutes towards Sendlinger Tor. You should travel 1 stop from Sendlinger Tor on the U6 or U3 towards Olympia-Einkaufszentrum to reach Marienplatz (1 minute). Be the first to write a review about the Hotel Sendlinger Tor! See below for more information. Have you already visited the Hotel Sendlinger Tor? If so, let everyone know what you thought about it by writing a review! No registration necessary. Just click here to start writing! Prices from €50 per night. Prices from €109 per night. Prices from €52 per night.